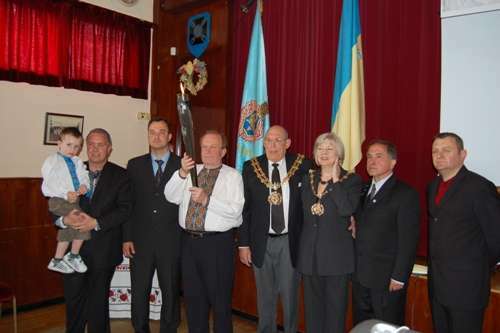 On the 1st July 2008 at 1pm in the presence of the Mayor and Mayoress of Tameside, local Councillors distinguished guests and three generation of the Ukrainian community The chairman of AUGB Rochdale officially handed over the Torch of Remembrance to the chairman of AUGB Ashton Stefan Wolosiansky flanked by Anna Fedeszko Chair of the Ukrainian Youth Association in Ashton (CYM), Anna Bolton Chair of the Women’s Organisation in Ashton (OUZ) and members of the SUB Committee on the steps of the Ukrainian Centre. Arriving with the torch were Askold Lozynsky (President of the Ukrainian World Congress), Vladyslav Rohoviy (2nd Secretary to the Ukrainian Ambassador in the UK), Bohdan Ratych (2nd Deputy President AUGB Limited) and Martyn Chymera (member of the central committee of the Ukrainian Youth Association). From the front entrance of the centre the torch was carried by the Chairman with the Mayor by his side into the community hall where more than 70 people had assembled to pay their respects to the 7million plus victims of the Holodomor. God of spirits and of all flesh, You trampled death, You made the devil powerless, and You gave life to Your world. Now, O Lord, to the souls of Your servants, who have fallen asleep, grant rest in a place of light, a place of verdure, and a place of tranquility, from which pain, sorrow and mourning have fled. As the good and loving God, forgive every sin of thought, word or deed they have committed. There is no one who will live and will not sin, for You alone are sinless. Your justice is everlasting justice and Your word is truth. In blessed sleep grant eternal rest O Lord to Your ever to be remembered servants and make their memory everlasting. Then requested a minutes silence The Mayor of Tameside Councillor Jack Davies gave a short speech admitting himself that he was one of many who knew nothing or very little of what happened in 1932 to 33 and added that events such as these should be brought out into the open for the world to know and be recognised for what they are. The community Chairman presented the Mayor with a copy of the book ‘Genocide in Ukraine’ then thank every one for coming to today’s commemoration. The local press were present which appeared the next day for all of Tameside to read. After the ceremony a small reception took place for all and the book of remembrance was passed round for all to sign. After the President of the World Congress, Second Secretary to the Ambassador and guests were invited to the Mayors parlour at the Town Hall for refreshments and general chitchat. Askold was very interested in hearing about the history of Tameside and our longstanding traditions. The Mayor and President spoke on various issues including American politics. Before leaving both Askold and Vladyslav received gifts from the mayor as a reminder of their visit to the Borough. The party then left for its next appointment, the Ukrainian Community in Stockport.